We handle all your Roofing needs by installing architectural and designer asphalt shingles, Cedar shake, Slate, Standing Seam Metal, Low slope membrane, EPDM rubber, and TPO. Every job is performed safely and supervised by a Project Manager to ensure that any questions you may have will be answered immediately. Replace old, broken, or drafty windows with new energy efficient vinyl windows by Alside. We install Picture, Double-Hung, Casement, Bays and Bows. 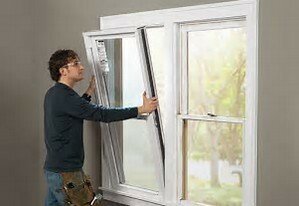 Alside windows not only make your home more beautiful, they save you money each month on your energy bills. 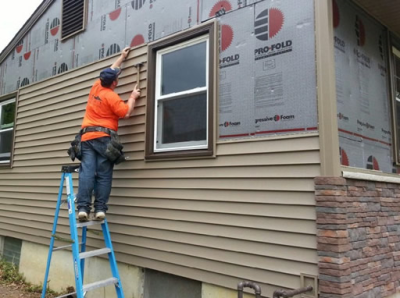 We remove and dispose of every type of Siding including Asbestos. 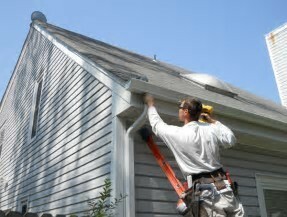 Replace old, cracked, and faded Siding with new Vinyl or John Hardie Fiber Cement. We can add insulation to the exterior walls to lower your energy bills while enhancing the appearance of the home. We can replace your old wooden deck boards or you can upgrage with low maintenance Trex composite decking. We can design a new deck for you (wood or composite) complete with steps, landings, and even vinyl railings if you choose. 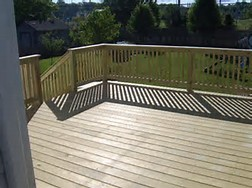 Trust your home to a professional to handle all your decking needs. Replace your old gutters with new aluminum (dozens of different colors to choose from) or replace with new half-round copper gutters. Improperly pitched or improperly maintained gutters can cause water to enter the basement and even cause foundation damage. Install new gutters to manage rain water and protect your home. 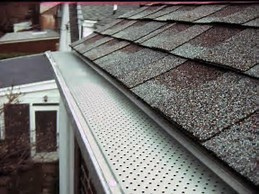 We can install leaf guards to protect your home from clogged gutters. Improperly funtioning gutters can cause Roof leaks, water entering the basement, and even foundation damage. Cleaning gutters several times a year can also be very dangerous to homeowners due to potential falling risks. 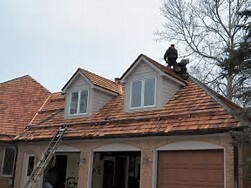 Don't put your life in danger and let a professional take the worry away from ever having to clean the gutters again.